Eid-ul-Azha is one of the biggest religious festivals for Muslims that calls for sacrifice of domesticated animals to commemorate the willingness of Ibrahim (PBUH) to sacrifice his son Ismail (PBUH) as an act of obedience to Allah, the creator. For Bangladesh, Eid-ul-Azha or Qurbanir Eid is more than just a religious festival. A whole range of economic activity sets about the festival, opening a volley of employment and business opportunity for people from different walks of life. Qurbani Eid is a lot about the exchange of money. The business cycle starts with the raising of cattle, sheep and goat either by individual farmers or by large animal farms. Mohammad Amin Uddin, one such cow farmer from Ishwardy has bought four deshals (a local variety of cows) six months before the Eid, which he plans to tend and sell in the cow haat near his village. “I have invested between Tk 10, 000 to Tk15, 000 per deshal and expect to sell those for around Tk 50,000 each,” he says. Forty-two-year-old Khantu, a cow trader from Kushtia, who is doing business for the last 22 years, says rakhi gerosto is a totally different occupation whereby farmers buy cows six to three months prior to Eid with the aim of selling the animals at the Qurbani haat. “These farmers usually bring out the animals only on the day of the sale, feeding it constantly with grass and bhusi (husk). The meatier the cow, the higher the price,” he asserts claiming that the cows from Kushtia are of the best quality with Chuadanga and Pabna following the lead. “Then there are the cow farms that can rear upto 200 cows adding tablets in their feed to make the cows beefy. 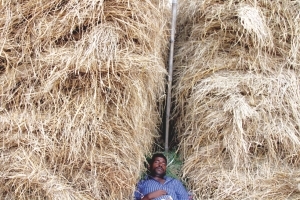 You will not find such unscrupulous practices among the ordinary farmers,” he asserts. According to a Bangladesh Agricultural Research Council report, the country had a meat deficiency of 78.9 percent in the year 2007-2008 and per capita number of cattle — cow, goat or sheep — does not amount to one person's consumption needs. Under the circumstances, the supply-demand gap for animals for sacrifice increases during Eid-ul-Azha and local supply of livestock cannot satisfy the excess demand. 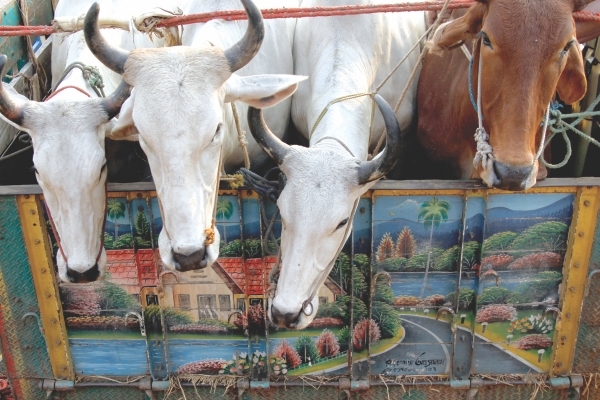 As a result, the number of cows that are brought from India through informal channel rises; Indian export policy does not allow the export of live animals from India. Despite the restriction, cows continue to arrive from the neighbouring country. According to a Border Guard Bangladesh official at Navaron Bazar, Jessore, the number of cows that arrived from India in August 2011 was 15,986 and in September 21,517. Mohammad Shahidul Islam, a businessman from Benapole, explains this informal cattle trade: “There is a place called Putkhali, 2 km from Benapole. Bangladeshi cow traders place orders for cows to Indian cow traders over mobile phone. 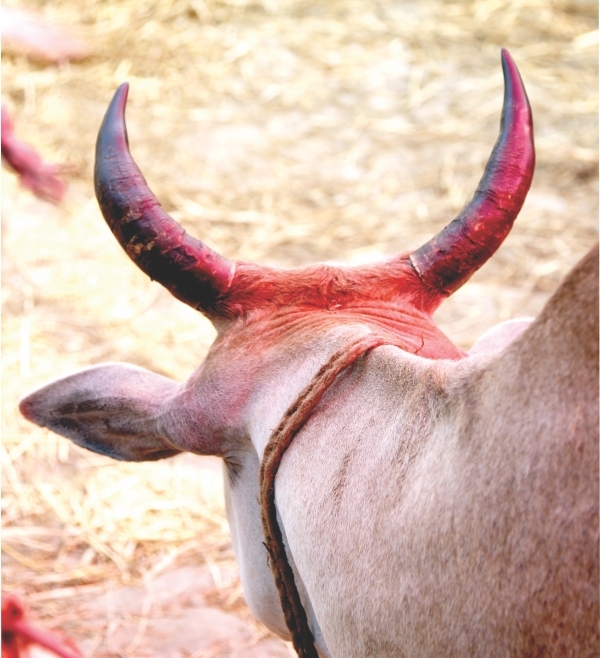 The Indian cow traders then drive the herd into the Ichhamoti river putting specific marks on the animals so that their Bangladeshi counterparts can identify their merchandise. 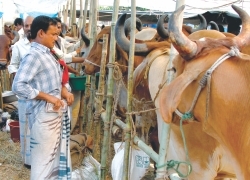 Once the cows cross the river, the Bangladeshi traders collect them and take them to the customs office at Navaron bazaar, where the custom officials issue a VAT registration number for Tk 500 per cow.” The payment for the cattle he says is settled through hundi. The animals arrive at the large city haats passing through a network of cattle traders who are connected by truckers. Mohammad Shahbuddin, a truck owner operates his truck between Aricha and Gabtoli sometimes carrying cement, sand, bricks but only animals during Eid-ul-Azha . “I bring the animals from the trawlers that come from Kushtia. A trip takes about six hours up and down for which I earn Tk 4000. My expenses include Tk1000 fuel cost, Tk 500 for food and drink and I have to pay Tk 200 to the helpers,” he informs. He adds that the number of cattle or goat that a truck can hold varies depending on the size of the animals. In case of cow, a truck can carry a total of 30 to 45 cows. Shahbuddin informs that during Eid about 100-150 trucks of animals arrive at Gabtoli per day. Demand for ropes and decorative items runs high during Eid-ul-Azha. Gabtoli haat, the largest and the only permanent animal market in Dhaka, nevertheless attracts the highest number and variety of animals. It is well endowed for the keeping of cow, goat, sheep and buffalo. Shanties are built around the haat for the cattle traders to stay and security is provided by the haat management committee. Concrete platforms with drains run in-between with proper supply of water and electricity; and bamboo fences and enclosures are constructed for the animals. Sanowar Hossain, a member of the haat management committee says, “We do provide security; however it is also true that we cannot do much when some livestock are stolen during electricity outages; also a lot of people cannot identify fake notes. We do not have vets but we have animal experts who can identify symptoms of diseases. In order to ensure that the day to day activities of the haat go on smoothly, 500 extra people are hired 3-4 days before Eid.” When asked about the funding of expenses on maintenance, he explains that the haat is leased out every year by the government to a lessee. The lessee earns from the hasil (tax) on each animal sold at the haat and is paid by the buyer at a rate of 5 percent of the animal price three days before Eid and 3.5 percent otherwise. The bustle of a haat in Dhaka. Around the haat are various tea shops, stores selling decoration items and accessories needed for the animals. Amir Hossain, owner of a fast food stall, says that he does not pay any rent for his shop that he has set up in 1990 because in his opinion the haat is government property and hence free. 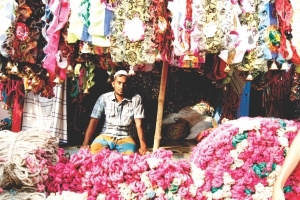 Mohammed Abu Zaffar who comes from Sirajganj and has been running a decorator's shop for the past five years selling sticks, which he buys from Kallyanpur, ropes, and other decorative materials from Sirajganj. Profits are obviously made during Qurbani Eid when his products are high on demand. “Some people spend as much as Tk 1000 to decorate their sacrificial animals,” he says. At a budget of Tk 60, 000, Zaffar has targeted a profit of Tk. 40, 000 to 50, 000 for the upcoming Eid. Mohsin Member is a permanent animal trader, who lives in Dhaka and has been involved with cattle trade for generations. Particularly for Eid-ul-Azha he has kept seven cows of various sizes ranging from prices at Tk 45, 000 to Tk 65,000; the profit he hopes to make per animal ranges between Tk 5000 to Tk15,000. “All our cows are deshi, we also expect losses,” he says as he points at one of his cows that seem relatively smaller in size. Asked about his budget on these animals, he says he has kept aside Tk 50, 000 for cow feed which he buys from Mirpur Bora Bazar. “Since we take care of the cows ourselves we do not really spend much on their maintenance,” he adds. Trucks of cows reach the city in scores a few days before the Eid. Mokbul Hassan has brought twenty goats and seven sheep in the haat for Eid. He has a budget of Tk1 lakh to spend on feeding, transport and maintaining the animals. He expects to sell the goats between Tk2000- Tk12000. “At least Tk150 profit per animal would be good enough for me,” he says. Soleman Poramanik from Pabna sells buffaloes and has spent up to Tk10, 000 behind his four buffaloes but he is expecting a loss rather than a profit. Most cattle traders affirm that in comparison to other places of the country, the highest number of animals is sold and slaughtered in Dhaka during Eid-ul-Azha. 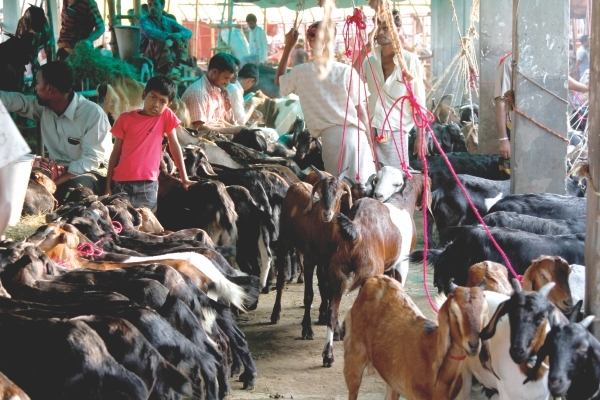 As a result, a wide variety of animals is found in the Dhaka haats during Qurbani Eid. 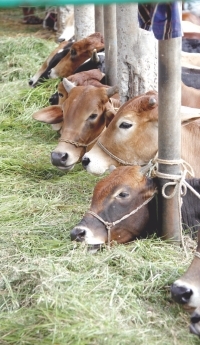 Cows have been brought in the Gabtoli haat from as far as Korea and sold at prices as high as Tk12 lakh. There were camels from India and of course the great black Bengal goats. Some of these animals have been raised solely for the purpose of selling during Qurbani Eid almost a year ahead. Usually cow traders hire 10-12 people to bring the cows to the haat, tend them and help in sales. Liton, who has arrived in Dhaka from Chuadanga recently with his employer, washes and feeds the cow of his mohajon (cow trader). “I earn Tk 2000 per week and sometimes people pay Tk 400-500 as bakshish,” he says. He stays at the temporary lodging near the market with the other people who work at the haat. 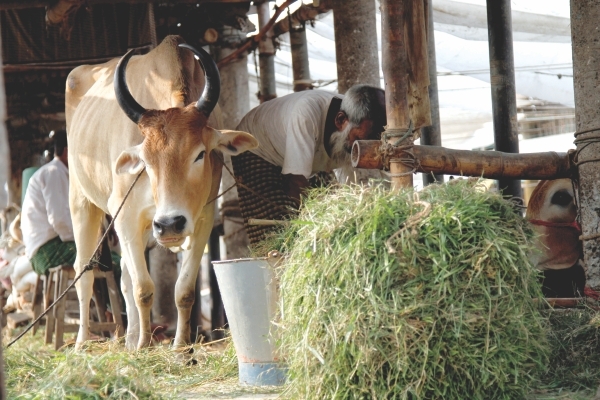 Tending and feeding cows at the haats provide scope for employment. For the last 20 years Sumer Ali has been bringing in bundles of grass in a van to the Gabtoli haat. He and his partner cut grass from places like the fields of High Court, Airport and the zoo and sell each bundle between Tk 70 to Tk100. Obviously Eid-ul-Azha helps Sumer Ali earn an extra buck. Like Sumer, Hawa also makes a living at the haat supplying water to the animals of the cow trader. Married to a cow trader, she has been doing this work for the last 22 years, raising his two sons with the meagre Tk 250-300 she makes per day. Nothing at the haat goes to waste especially not the cattle dung. Workers like Rajib clean the shallow drains that run between the rows of cattle and collects the dung in basket, piling it at one corner of the haat to be sold later. He informs that he will sell the dung to people who use it as fish feed. Animals are often raised almost a year ahead solely for the purpose of selling at Qurbani Eid. The sale of refrigerators goes up during Eid-ul-Azha. 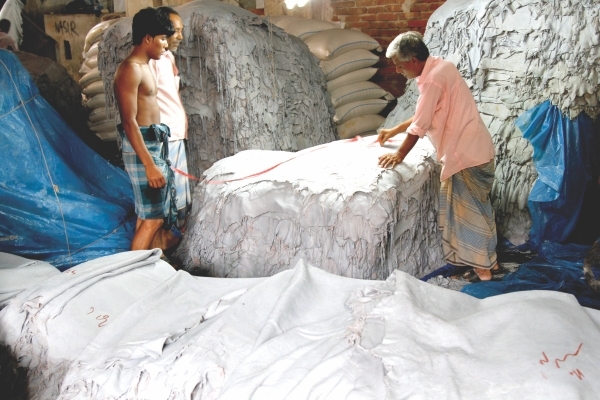 Besides Gabtoli, temporary haats are leased out by Dhaka City Corporation (DCC) a month before Eid. Md Golam Rahman Mia, Chief State Officer (DCC), informs that the number of temporary haats has increased from 11 to 13 this year and the processing for another is still on the way. DCC's earning from leasing haats has increased from Tk 43.8 million in 2010 to Tk 73.21 million in 2011 which roughly constitutes one percent of the total yearly income of DCC. Golam Rahman adds that the government will earn 15 percent VAT on the animals sold plus 5 percent income tax paid by the person who takes the market spot on lease. Humayun Rashid Johnny who has taken lease of the haat adjacent to Taaltola, says that he has spent about Tk 1.80 crore including VAT and tax to lease the haat this year. Besides, he has to rent lighting services from City Corporation, promote the haat by putting up posters and banners, recruit security guards and volunteers, and finally pay the police station for additional security. “We put up posters in the haats outside Dhaka and communicate with paikars (wholesalers of animal) over mobile and encourage them to bring their animals in our haat. We get in touch with truck association leaders asking them to solicit our haat to the paikars in exchange of Tk 400-500 commission,” says Johnny explaining the importance of haat promotion since the more animals sold in the haat the higher will be the hasil earned. “I am hoping to sell at least 10,000 cows through my haat so that I can earn at least Tk 2.5 crore,” hopes Johnny. For Shayak Ahmed, a Biology teacher at an English Medium School, the religious aspect of the festival demands priority. Yet the sacrificial animal has to be in good health and should provide enough meat for sharing and distribution. “By looking at the teeth of the cow, its age maybe estimated, older cows are preferred to younger cows. The colour is something we look out for because the kids of the house give it great importance. We all contribute as much as possible so that we can have some good meat, share with our close ones and also please Allah,” he says. Although Shayak Ahmed does the slaughtering himself, many devotees prefer hiring a moulavi or a pious person to carry out the initial slaughter. Imams of mosque and madrasa students often earn between Tk 100-500 for each slaughter as honorary fee on the Eid day. Chhuri, Chaku, Boti, Da – the butcher's tools. 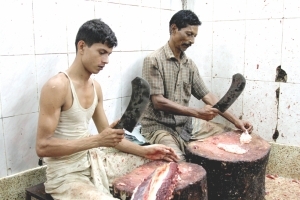 However, for proper cutting of the meat, professional butchers become the most sought after men during Eid-ul-Azha. Noorul Amin, a butcher at a local meat shop talks about the extra profit he makes during Qurbani Eid. Depending on the size of the cow he hires helpers and thus charges more. “I do not charge less then Tk 3000, often the pay is a percentage of the price of the animal. In that case I always look for bigger animals,” informs Amin. Sometimes day-labourers turn into butchers airing the Eid charging around Tk 100-150 per Tk 1000 of the price of the animal. The most important tool for the butcher, the knife gives rise to another business. 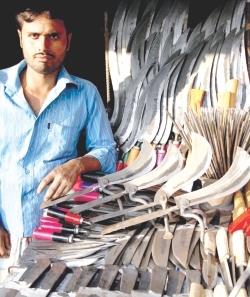 Mohammed Amir Hossain, a knives seller at Karwan Bazaar says that sales of three types of knives are high in demand during Qurbani Eid; the jobai chhuri for slaughtering of the beast, chhila chhuri for skinning the beast, haddi chhuri for separating the bones. The jobai chhuri sells between Tk 100-150 and the chila chhuri for Tk 20 per piece. Most households sharpen their knives during this season. Mohammad Ghaus Mia, peddles around the city carrying his sharpening cycle on his shoulder. “Although I have learned this trade from my master, I have to work as day labourer for most of the time of the year, because this occupation is seasonal and generates a meager income,” says the middle-aged man while sharpening a boti, a curved cutter. He adds that he charges Tk20 per boti and for big knives like the da, he charges Tk 30. 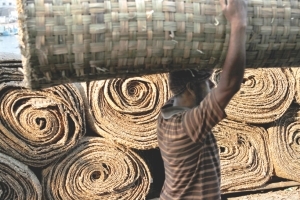 Bamboo mats ensure clean meat processing. Butchers become the most sought after men during Eid. 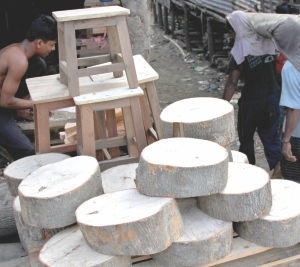 Chatai or bamboo mats to keep the meat on, another important component of Eid-ul-Azha, are mostly made in Barisal. Illiyas, salesperson of Messers Sharif and Brothers, in Jinjira says, “If on an average we sell 2000 piece of chatai per month then during this Eid we sell 10,000.” Retailers from bazaars in Dhaka buy these mats either directly from the wholesalers or from van drivers who peddles the mats selling those for Tk 38 to Tk 45 per piece. Another business that enjoys a boom during Eid-ul-Azha is the sale of refrigerators. Salim Al Mamum, Showroom Manager at Transcom Digital informs that sales of deep freezer usually goes up 3 to 4 times during this Eid and the demand starts building up 15 to 20 days before Eid. Farhadul Azim, sales officer at Sony-Rangs also provide similar data. “About 58 to 60 percent of the entire sales of deep freezer occur during the month before Eid,” he says. Nevertheless, electronics companies' offer cash discounts and other offers to cater to this seasonal demand. Some beggars often make a windfall gain from the Qurbani Eid. During this Eid, Mokbul Alam, besides the usual alms, collects meat from various houses and sells them to restaurants. “People always give away the worst part of the animal they sacrifice to us; they then go to expensive restaurants to eat,” he says with a cynical ear to ear grin implicating 'what goes around eventually comes around'. Dr Amir Hussain, a Professor and Chairman of the Department of Economics of Jahangirnagar University, says that there are no exact figures demonstrating how much Eid-ul-Azha contributes to the economy. “One can hypothetically say that the income made during Qurbani Eid if reinvested into the economy will contribute to the economic growth rate,” he adds, explaining how that the activities surrounding the Eid increases consumption, government earnings, and adds to the national export figures. Eid-ul-Azha, in Bangladesh, generates a huge amount of cash transaction especially at the haats, building up liquidity pressure in the banking sector. Banks often borrow money at high interest to meet the excess demand for cash thus increasing the call money rate. Whereas private commercial banks deal with excessive demand for cash from retail customers, public banks witness the full use of cash credit limit extended to the tannery industry. M A Jabber Mia, Deputy General Manager, Loans and Advances, Department-1, Bangladesh Krishi Bank, informs that this year Krishi Bank has extended Tk 5.10 crore to this sector adding that tanners usually withdraw the full amount of the one year Cash Credit Loan to buy and process hide during Eid-ul-Azha and within 270-280 days they start repaying the loan. 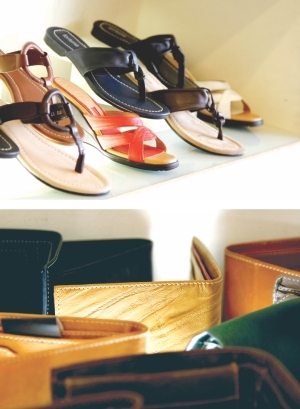 Leather and leather products earn foreign currency for the country. Leather and leather products constitute one of the major exports of the country. According to Export Promotion Bureau, in 2010-2011 fiscal year, leather and leather products worth 353.25 million dollars and footwear worth 297.80 million dollars have been exported. Md Shaheen Ahamed, Chairman Bangladesh Tanners Association informs that the hide collected during Eid-ul-Azha constituent 50 percent of all hide collected in a year. “Even the quality of the hide collected during Qurbani Eid is better since most people try to purchase the best animals for sacrifice,” he says. “The hide changes hands at least thrice before reaching the tannery. Seasonal brokers collect hide at the field level say from madrasa or orphanage and sell to a Foria (another middleman) who in turn sell to Aarotdars (the warehouse owners),” he explains. Shaheen notes that out of the Tk 2000-3000 crore invested by tanners during the Eid, banks finance about Tk 300-400 crore; the rest of the amount is financed by middleman. In Shaheen's opinion, even the local leather footwear industry at Bangshal and Siddique Bazaar cannot be ignored since their manufactured product saves about Tk 400 -500crore in import of Chinese shoes. “The local markets at Bangshal and Siddique Bazaar are fulfilling the demand of 17-18 crore of people,” he asserts highlighting the importance of this sector. Notwithstanding the solemnity of Eid-ul-Azha, the joy that this festival brings in the homes of many through monetary gains is undoubtedly unique. Even though the actual contribution of this festival to our lives in spiritual and monetary terms cannot be measured precisely, we are once more reminded how Providence showers us with earthly blessings through all His creations. 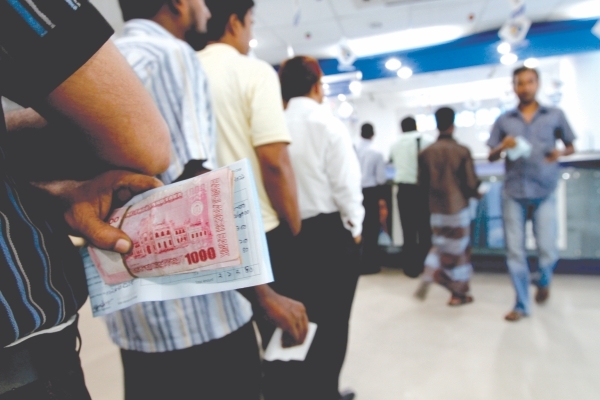 Liquidity pressure builds up at the banking sector during this Eid. 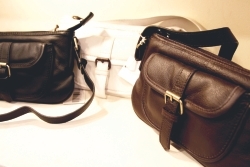 Bangladeshi leather products have considerable demand in the international market.